Bakersfield, California became Sister city to South Korea’s Bucheon in 2006. Yet Bucheon, South Korea is responsible for the ongoing horrendous torture and killing of dogs and cats. Bucheon is one of the largest dog meat consumption areas in South Korea. If you have ever wondered what hell would be like, just visit or watch the videos of dog farms and slaughterhouses scattered all throughout Bucheon. There are countless dog farms from small to very large, markets and restaurants where the dogs, who are tortured their entire lives, end up being slaughtered in the most inhumane ways, such as by electrocution, hanging or beating; and then thrown into boiling water – sometimes while they are still alive. In many places, dogs are being killed in full view of other terrified, caged dogs; and this takes place in public and in broad daylight. In addition, many abandoned and stolen former pets end up in this industry, and are subjected to the same cruelty. A Search Engine reveals the sickening scale of Bucheon’s dog meat demand. 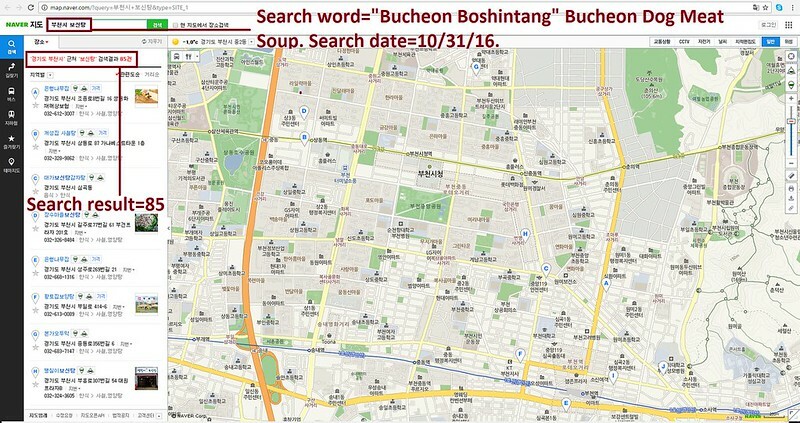 The searches resulted in: 219 Health Food Centers ; and 85 restaurants in and around the city of Bucheon alone. 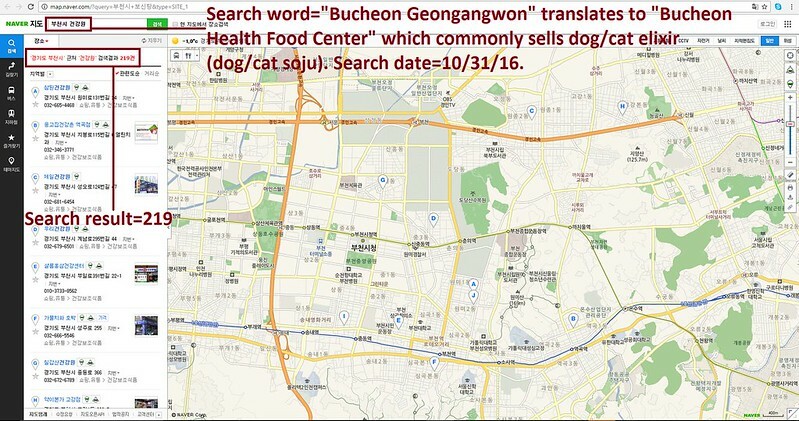 Even if half of these ‘Health’ Food Centers and restaurants serve dog and cat ‘ingredients’ in one form or another, just imagine how many dog/cat slaughterhouses must be present in and around Bucheon in order to supply all of these outlets. Please sign petition, call and email Bakersfield Mayor Harvey L. Hall TODAY! Send a copy of your letter to the Bucheon Mayor Man-Soo Kim! Please watch the video from one of countless dog farms in Bucheon: https://youtu.be/2mwAH3M7boc. No matter where you live PLEASE SHARE these actions with your friends – especially those who live in Bakersfield! Do not let dog being tortured, being beaten and eaten !!! Why is this practice still being done with the consumption of eating pet type dogs or maybe even cats ? Where is your sanity, thinking – it should be made a LAW not to do this horrible act ! Please I ask, STOP DOING THIS, MAKE IT UNLAWFUL IN DOING SO, IT’S “WRONG” !! Thanks for reading & make it happen. Please stop this barabric practice! How can people be so inhumane and cruel? It is disgusting treating living beeings who can`t defend them selfes like this! Gli animali vanno amati,io, proprio ieri, ho perso il mio cane….. Non potete immaginare come sto’ male. Unfortunately this IS unlawful already but according to the petition, the laws are not being upheld or enforced. No-one seems to be being punished! No-one seems to care in South Korea. Apart from this being incredibly cruel, it is making a mockery of the Korean judicial system! I have emailed (and will also write to) the Mayor and also the Korean Embassy in my country too, as suggested. Thank you koreandogs.org! Thank you so much, Emma!!! Everyone needs to boycott all Korean goods. Cars, electronics, food, clothing, shoes, the Olympics. EVERYTHING KOREAN. actions, and LIVE LIKE HUMAN BEINGS. Stop these poor animals from being tortured!!! Boycottn anything from over seas…Buy made in USA…SICK INDIVIDUALS!!! Blasted zombies. They’re the living dead who do this, as foretold in Revelatiions. Sathya Sai Baba calls them “living corpses”. These demented, deranged individuals don’t deserve to see the light of day! If they were subjected to the same horrific torture they’d be singing a different story. Rotten monsters! Can anyone make them go to hell a lot quicker somehow? Poor babies that suffer so intolerably because of wretched monsters. WE NEED the UN to step in ASAP. Everyone sign all the petitions!! We are going to stop this CRUELTY. must end this cruelty on these great animals now. This deliberately abuse against animals must come to a definitive end. Outrageously strange that it is still allowed. Please listen, if you don’t care about the animals, understand that there are loads of people who is suffering their hearts out every day and night knowing this is going on. Countless dog farms & slaughterhouses are scattered throughout, & they truly are hell on earth for the defenseless dogs suffering there. Dogs & cats exist their entire lives in squalid, feces-encrusted raised wire cages in utter misery only to be slaughtered in the most horrific of ways – by electrocution, a hammer blow to the neck, being hung or beaten, bleeding to death from a slashed throat, being burned to death from a blowtorch, or thrown into a vat of boiling water while still alive. — WHAT SANE & MORAL SOCIETY WOULD ALLOW THIS? PLEASE, LET’S DO THE RIGHT THING -THIS IS ALWAYS THE BEST OPTION. Think of the future for ALL people — LET’S ABOLISH THESE DRACONIAN, BRUTAL FARMS -LET’S RESCUE THESE DOGS & CATS.